Be the first to share your favorite memory, photo or story of Ortha. This memorial page is dedicated for family, friends and future generations to celebrate the life of their loved one. 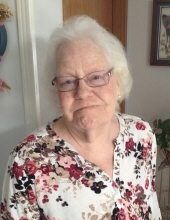 Ortha Darkis Hornsby, a resident of Milford since 1955, died on April 14, 2019 at the age of 92. She was preceded in death by her husband, William Henry Hornsby in 1978, and sons, John Mitchell Hornsby and David Wayne Hornsby, and grandchildren, Darla and Barry. She is survived by her son, William E. "Gene" (Dianna) Hornsby; daughters, Freda (Jan) Olmstead and Shirley (Barry Whitehead) Valentine, and many grandchildren, great grandchildren, great great grandchildren, and great great great grandchildren. A Funeral Service will be held at Lynch & Sons Funeral Home, 404 E. Liberty Street, Milford, on Saturday, April 20, at 10AM. Burial will follow in Milford Memorial Cemetery. Friends may visit at the funeral home on Friday, April 19, from 3-8PM. Memorials may be made in her name to the Michigan Humane Society or to the Vietnam Veterans Memorial Fund. For further information please call 248-684-6645. "Email Address" would like to share the life celebration of Ortha Darkis Hornsby. Click on the "link" to go to share a favorite memory or leave a condolence message for the family.